Product Find out new features and details about our product. Showcases Here are examples of how our users successfully used Walls.io. Social Media All about the crazy social media world and all the platforms. Events Some events with the support of Walls.io. Team About our Team and it's deepest secrets. All Categories A nice mixture of all the categories. Showcases Here you can find some examples of how our users successfully used Walls.io. Social Media Everything about the crazy social media world and all the platforms. Events Take a look at some events with the support of Walls.io. Thank you for downloading the Hashtag Campaign Bible eBook! The recent introduction of our social commerce button started with our customer Marco Pace at beyerdynamic, who asked if we could implement something like that for Walls.io. Always happy to oblige our customers when they suggest cool new features we got to work. About half a year later, the Walls.io social commerce button went live and beyerdynamic was the first customer to start using it. Our social commerce button for social walls helps you turn user-generated content into sales by converting visitors to your wall into buyers of your product. The button can be added to any social media post on your social wall. You can choose from various calls to action — be it a buy now button, a download button, an apply button, etc. Use it to lead people to gated content, job applications, donation pages or, quite importantly, a product sales page. To add a button to a post, simply navigate to the Moderation panel in your Walls.io dashboard. Scroll to the post you want to enhance and click on “CTA”. You’ll get a popup where you get to choose the name of your button and add the link you want people to go to. A social commerce button works best if it leads users directly from the content they are already viewing to the page where they can take the action you want them to take. To find out more about our social commerce button and what you can do with it, check out our Social Commerce with Walls.io blog post. After we introduced the new features, many customers started using the social commerce button right away. But we wanted to know what and how our first social commerce customer was doing with it. 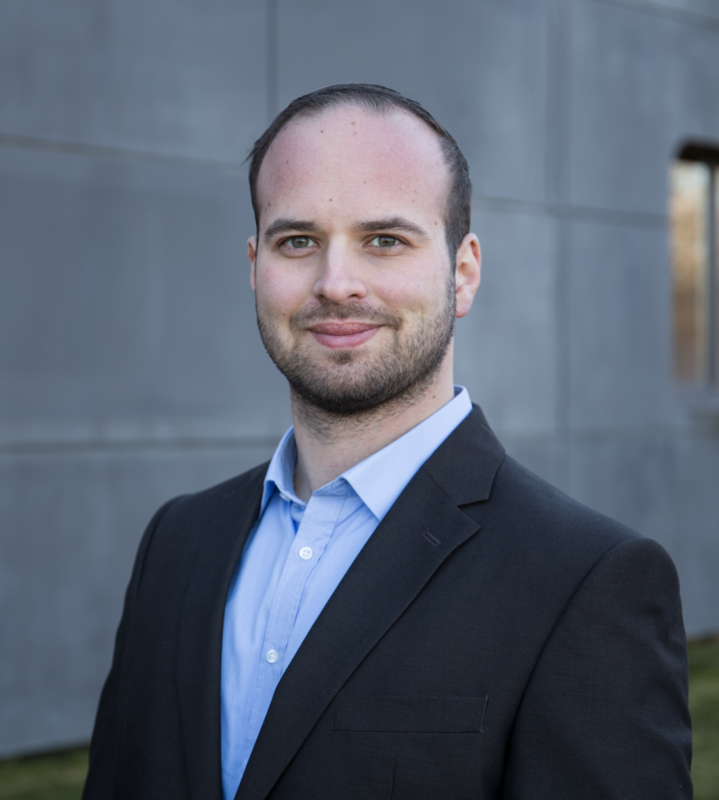 So we talked to Marco Pace, social media specialist at beyerdynamic and instigator for the feature, about how the company, a German manufacturer of audio equipment, is using the social commerce button. What made you suggest a social commerce feature to our team in the first place? 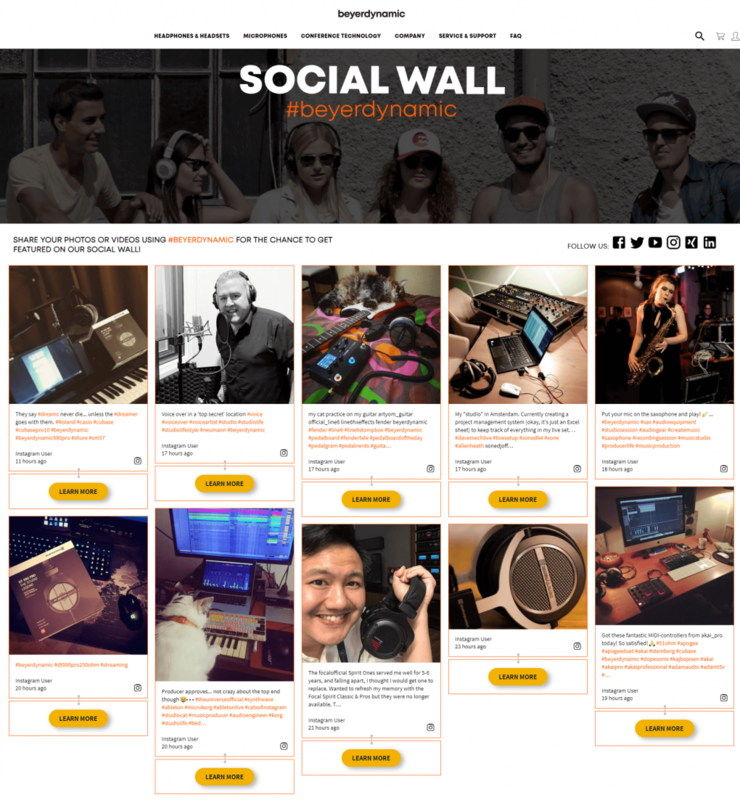 In June 2018, I started working as a social media specialist at beyerdynamic and from the get-go, I was thinking about setting up a social wall. I did my research and quickly settled on Walls.io. When I brought up the idea of a social commerce button with the Walls.io team, they were really into it. How are you using the new Walls.io social commerce button and what do you hope to achieve with it on your social wall? Our aim is primarily to call attention to our products. If we end up selling more because of that, that’s fantastic. But it’s not our main goal with this campaign. There’s an in-house effort involved as well, as it’s important to build awareness among colleagues that UGC doesn’t just have to be relegated to a separate landing page. UGC can and should become an integral part of product pages as well. What is your workflow for adding the buttons to social media posts? Every morning, I check for new pics on our social wall. I then try to identify the product and tag it accordingly, with a link leading from the button directly to the product page. I have an Excel sheet with a list of all our product pages, from which I can copy and paste the links. It takes me about 15 to 30 minutes to do this every day. We’re obviously trying to tag as many products as possible, which can be a little difficult as you have to be able to spot the differences in the photos. Not everyone mentions the exact product name in their postings, so we first have to identify the product just from visual information. How and where are you using the social wall? We’re not using the wall as much as we’d like to, but that’s mostly because I haven’t gotten around to it yet. We do have a specific landing page set up and we link to it from our home page as well. 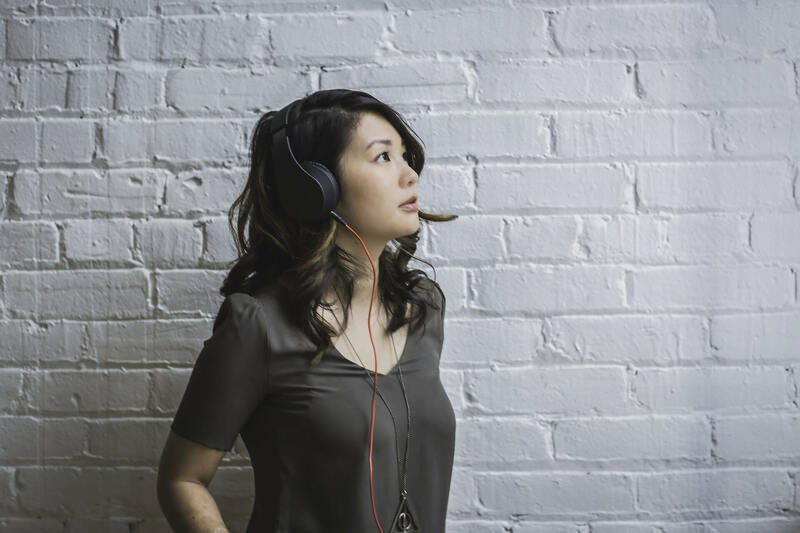 Our next step is to implement specific social walls on our bestselling product pages. We’ve recently also started promoting the social wall offline, using leaflets that we enclose with our packaging. It’s extremely gratifying for both me and our design department when we spot pics of our headphones and the leaflet next to them on social media. What kind of users or use cases would you recommend this feature to? I can wholeheartedly recommend the social commerce feature to anyone who wants to get into social commerce. Even though I’m tagging every single social media post on our wall manually, the time effort is in fact negligible. One thing I’d like to emphasise is that it’s not as simple as just setting up a social wall and adding social commerce buttons. You need to actively create a campaign and promote them online and offline. Furthermore, social media departments will have to make the effort to create awareness within their own company. And that requires a whole lot of creativity and assertiveness. Start adding CTA buttons to your best user-generated content and turn your social media wall into a social commerce beast. You don’t have a social wall? CREATE one now! After talking to Marco, a few things about the dos and don’ts of social commerce buttons have become pretty clear. The effort of manually tagging products is not to be underestimated. You do have to manually go through the posts on your social wall, decide which of them you want to tag, and then add the link to the relevant page. However, as Marco states, if done regularly the effort is very much manageable. Set time aside each day or every two days and consciously make room for the task on your calendar or to-do list so you can’t forget or procrastinate it. This way you’ll avoid having to wade through gazillions of posts at a time and stay on top of the work. As I so often say here on this blog, a landing page is your best friend. It’s a convenient hub where you can both explain your campaign and show off your social wall. Knowing what it’s all about will remind people to use the hashtag and populate your social wall. Another favourite of mine is promotion, and Marco clearly shares my opinion on this. You cannot run a hashtag campaign that you plan to turn into a social commerce project without letting people know that it exists. Beyerdynamic made an excellent decision when they started producing leaflets to go with sold products. That way, everyone who opens a package of headphones or unpacks a microphone gets some basic information about the campaign.